This is a foreign exchange guide to Sint Maarten, the Netherlands Antillean Guilder currency plus ANG transfers and travel tips. Netherlands Antillean Guilder exchange rates - latest & historic exchange rates. What is the Netherlands Antillean Guilder currency code and symbol? The three letter currency code for the Netherlands Antillean Guilder is ANG and the symbol is ƒ. Which countries use the Netherlands Antillean Guilder? It is the domestic currency in Curaçao and Sint Maarten. The interactive chart below shows the USD to ANG exchange rate for the previous 3 months with rate alerts for days when the exchange rate moved up or down significantly or for 30 day highs and lows. Sint Maarten, the Dutch side of the island, is completely different from the French side. With its tourist-friendly nightlife, slew of shopping centers including duty-free shops in capital Philipsburg, tacky casinos, numerous condo units and sprawling resorts, it can sometimes feel overdeveloped and artificial, but you'll also find a few peaceful, picturesque beaches around Simpson Bay and Little Bay. This 37-square-mile island, ringed with white-sand beaches, has been living with a split personality since 1648, when it became the smallest parcel of land to be peaceably shared by two countries: France and the Netherlands. 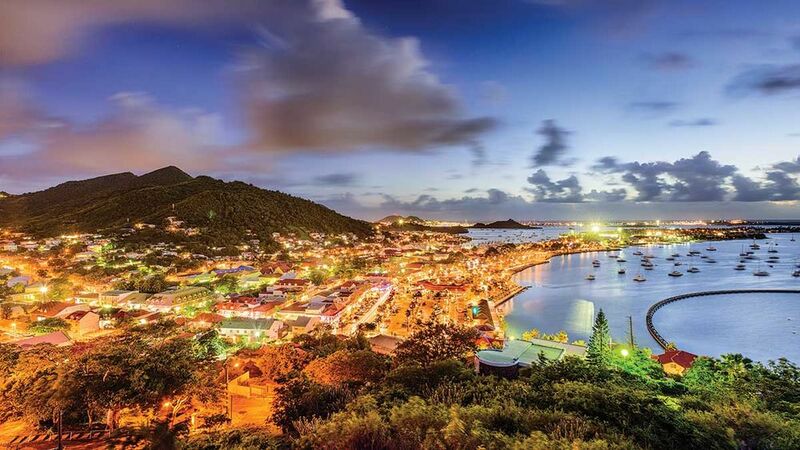 When you visit St. Maarten, the Dutch side in the south, it bustles with sprawling resorts, wide boardwalks, lively beach bars, and late-night casinos. Meanwhile, sleepy French St. Martin, with its harbor full of brightly colored boats and houses built up into the cliffs, is reminiscent of a Mediterranean ﬁshing village. Thanks to the French inﬂuence, you'll also ﬁnd some of the best food in the Caribbean. What currency to use in Sint Maartin? Despite the dominance of the euro since January 2002 within the mother country, Holland, the legal tender on the Dutch side of St. Maarten is still the Netherlands Antilles florin (NAf). U.S. dollars are really the coin of the realm here, and prices in hotels and most restaurants and shops are designated in dollars. On the French side (as well as on St. Barts), the official monetary unit is the euro, with most establishments widely quoting and accepting either dollars or NAf guilders as well. Getting around in Sint Maarten. Sint Maarten is home to the island's biggest airport, Princess Juliana International Airport, at Simpson Bay, which serves all intercontinental and numerous regional destinations. The island's cruise-ship terminal, Port St Maarten, is located in Philipsburg. A handful of other marinas have ferries to neighboring islands. Take the bus Things move at a more leisurely pace in the Caribbean, so take advantage of that by taking the bus to the top tourist sites. There's no set schedule for drop-off and pick-ups, but you'll get where you want to go for about $1.50 one-way. Rental car or taxi are the best ways to get around but beware of heavy traffic. Trisport rents bicycles, while Johnny's Scooter Rental rents scooters and ATV quad bikes. Sint Maartin is a popular stop for cruises. Travel tips for Sint Maartin. The peak season begins in December and ends around mid-April, as frozen travelers from the United States and Canada flock here to escape the cold at home. One of the island's most famous events, the Heineken Regatta, takes place in March. Travel to St. Maarten drops off between July and October, hurricane season in the Caribbean. The island offers the visitor many choices in the type of accommodations available to them. You can select a luxury villa or a simple guest house with many options in between. Many visitors to the island will be surprised to find the selection of villas available many at a price less than a standard hotel room on other Caribbean Islands. For Scuba divers, you will find a number of smaller resorts geared towards your needs. There are only a limited number of scuba liveaboards that sail from the island. Bring your appetite to St. Martin/St. Maarten, because you'll most assuredly put it to good use. Fresh seafood is often the star of many menus here (it is an island, after all), but there is a rich variety of cuisines to be found, from high-end French to Lebanese to Italian to traditional barbecue. Typical Creole dishes often include conch, goat and oxtail. You'll also want to try the island's national liqueur, Guavaberry, made from rum, cane sugar and local, wild guavaberries. A bottle also makes a great souvenir to take home. Save money and time by Ordering your Netherlands Antillean Guilder online from Travelex, you get better rates and can pick up the ANG cash locally or even on travel day at the airport. For card purchases if offered a choice of currencies always select to Pay in Netherlands Antillean Guilder otherwise you may get much worst exchange rates. Compare ANG travel cash rates - probably why you are here! When searching around for information on how to get a good exchange rate when sending money to Sint Maarten you need to start with finding out the latest Netherlands Antillean Guilder foreign-transfer exchange rate. Once your funds are received by the provider the converted ANG amount will be transfered to the recipient account you specify in Sint Maarten. Use our Send to ANG calculator to compare the exchange rates of FX specialist providers rates versus your bank's standard rates you can hopefully save around 5% and maybe more - end result is more Netherlands Antillean Guilder deposited into the recipient bank account and less margins and fees kept by the banks!